SA KAEO, May 16 — A Thai Buddhist group and its Cambodian counterpart joined with ‘Dhamma Yatra’ Buddhist pilgrims to urge their compatriots to use dhamma as a means to end the armed conflict between the two neighbouring countries. Dhamma, the teaching of the Lord Buddha, joined with Yatra means walk, so Dhamma-yatra is a Dhamma walk or march. The Thai Buddhist group led by Sulak Sivaraksa, a prominent Thai intellectual and social critic, known for his outspokenness, marched from Wat Mai Sai Thong in Aranyaprathet district of Sa Kaeo province to the Thai-Cambodian Friendship bridge on the border to welcome a Buddhist group from Cambodia which marched from a temple in Ou Chrov district of Banteay Meanchey province to the bridge. The groups held joint activities, including prayers, and lighting candles for peace and unity before proceeding to Wat Mai Sai Thong for more activities scheduled to be held until Wednesday. Thai and Cambodian Buddhist monks and academics were to attend forums and discussions on Buddhism and and seeking together the means to find solutions to the conflicts and obstructions to building peace. 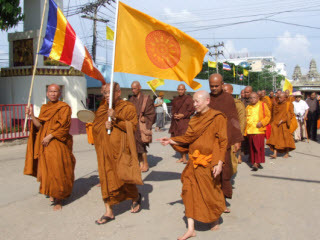 The Joint Dhamma Yatra was a cooperation between Buddhists in Thailand and Cambodia to create friendship and peace; and ease the conflict and mistrust between the two countries. The move was being held to coincide with Visakha Bucha Day Tuesday which marks the birth, the enlightenment and the passing away of Lord Buddha, which according to tradition miraculously fell on the same month and date in each of the three years.